Tina Fey | Sizzle: When The Media Sizzles, You'll Find It Here! When healthy enough, Adam Cook traveled to see his younger brother perform on the Idol stage. David Cook: Less than a month after announcing he’d participate in a charity run on his ill brother’s behalf, Cook made another announcement yesterday: his brother passed away after a 10-year battle with brain cancer. Too sad for words. TIME: Entertainment figures ranging from Tina Fey to Zac Efron made TIME’s annual list of the 100 most influential people. Also included: the ladies of The View and Jay Leno. Robert DeNiro: Did you know his twin sons were born via surrogate? Quickly learning that lots of celebs have gone that route and SJP is far from first. STILL SIZZLING: This animated series could make it to the big screen–if anyone finds the time to do it. Let’s hope it’s not canceled (again) in the meantime! Have no fear! Sarah's still here! Tina Fey: If they can’t get Megan Fox (and duh, you can’t! ), guys would most want to party with Fey, according to a new poll. The Bachelor: LOVE the reaction from the ladies on The View! HSM: The Disney Channel announced a fourth, made-for-TV installment but it’s not clear if the brains behind the series (Kenny Ortega) will be back or if it will include the new characters introduced in HSM 3. So is this guaranteed to fail? U2: Bono’s ego can grow larger, albeit temporarily, now that a street in New York City was renamed U2 Way. Have to admit we’re kind of jealous! Where is SIZZLE WAY?! Sarah Silverman: After some doubt earlier in the week, her Comedy Central show will continue now that Logo has agreed to co-finance the production. Logo, really? Silverman isn’t really someone we think of as being gay-friendly. The CW: Proving the naysayers wrong, The CW is actually making a profit for its parent companies. Now if everyone would just admit they love teen dramas as much as we do! Twitter: Why do celebs tweet? We read this Huffington Post piece and we’re still not sure! STILL SIZZLING: This top-rated but often criticized comedy just had its half-life extended yet again! 30 Rock: Yes! Finally found Tracy Morgan and Tina Fey‘s entire acceptance speech from the Golden Globes. Listen and laugh. You know you want to! Tom Brady: After fending off rumors last week that he proposed to girlfriend Gisele Bunden comes confirmation that they really are engaged–only it just happened this weekend. NFL: The playoff ratings were better than 24 AND the Globes. What does that tell you? TV.com: Trying to catch up to Hulu and other competition with new deals with Sony, MGM, et al. It’s a great resource (episode guides, etc.) but not the first place we think of for video viewing. Evolution of Dance: We were really looking forward to the second one but it was kind of disappointing. Any Winehouse: It’s the divorce no one will be unhappy about. “Blake incarcerated” is seeking to end his marriage to the mess of a singer. Our chances of working for one of these mags are disappearing by the day. Sigh. Tina Fey: Is Bristol Palin her newest babysitter? The offer has been made by Mrs. Palin. Fey’s response: “I was like, yeah, that’s exactly what 17-year-old Bristol Palin wants to do, at ‘SNL,’ is babysit the toddler of the lady that goofs on her mom.” We’re just wondering if Bristol will even want to babysit her own toddler. Redemption Song: American Idol for boozies, strippers and cons. We kid you not. Gotta love Fuse. Obama: Pundits across America are weighing in on last night’s last-ditch effort by Obama to secure American’s vote. But what about all the people that already voted through absemtee and early ballots? Lost causes? Phillies: MLB champs. Notice how we didn’t say World Series champs. Semantics, really, but how can you win a world championship when the whole world doesn’t have the opportunity to play? The MLB is only in America, folks! Jennifer Hudson: As expected, all the entertainment/gossip mags have Hudson-focused covers. Curious to see how they sell and which one does the best. 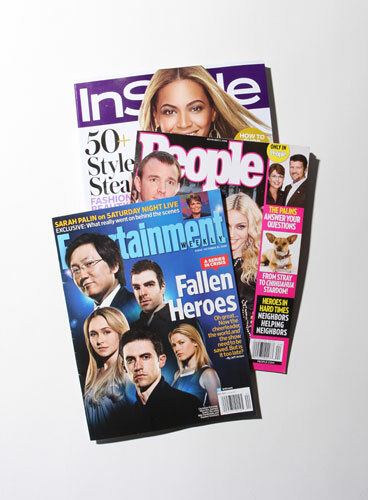 Time Inc.: Laying off up to 600 staffers in the coming weeks. Now how will we ever get a job there?! TiVo: Got TiVo? Now you got Netflix, too. The two have married. Applause all around. Except for us. We still don’t have TiVo. Or Netflix. STILL SIZZLING: Which actor has walked the line for the final time? He’s retiring at age 34!